This teaching, by Pastor Barry Forder, was given as part of our ‘Ressurection Day’ celebration on the 1st April 2018. As most will be aware, Easter was originally a pagan celebration. When the Roman Emperor Constantine ‘ legalised’ Christianity in around 300 A.D., Christians went from meeting in the catacombs and homes to meeting in lavish ornate pagan buildings. Sadly, at that time, many pagan ideas and practices were also introduced to the church – the celebration of Easter (Ishtar) being one of them. However, this has given the church an annual reminder of the greatest event in History! – The Resurrection of Jesus Christ! 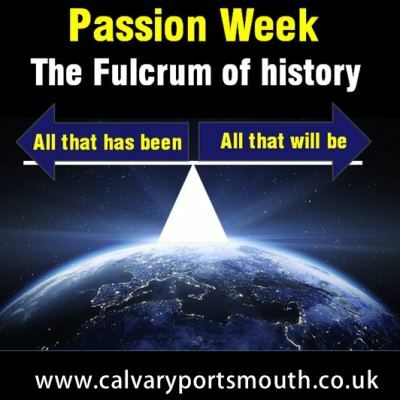 Passion week is the term often given to the week leading up to the crucifixion and resurrection of Jesus. It is the most pivotal week in all history, everything past and everything future all hang on the events of this one week. Ultimately, every individual’s connection with eternity will depend on their understanding of, and belief in the events of this week. The Apostle Paul argues that Christianity stands or falls with the resurrection. If it is just a myth, we are ‘of all men most miserable’! (1 Cor 15:19). But the historicity of the resurrection is without doubt one of the greatest facts of History! “As a lawyer, I have made a prolonged study of the evidence for the events of the first Easter Day. To me the evidence is conclusive, and over and over again in the High Court, I have secured the verdict on evidence not nearly so compelling. May this study help to confirm in your heart and mind the truthfulness of the Gospel accounts, and may its impact be that you can’t contain this most wonderful of all news, that Christ is risen and there is Salvation in His name!